I just got a brand new credit card in the mail and -- no more raised numbers! That's right, the credit card account number isn't able to be imprinted by those manual credit card slip machines. Wow. The account name is also not raised. The name and number is printed on the front; I can feel the printing ever so slightly, so I don't think it's under a protective coating, and it doesn't feel like it is "hot stamped" into the plastic, either. I hope that the info doesn't wear off over time. 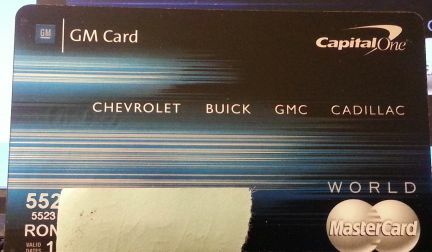 This is a Capital One credit card, actually the GM card which is a MasterCard. It used to be with HSBC until recently and we had just received new cards from HSBC for the GM account last month due to a security breach somewhere. But I wonder if this is on the Discover Card or other Visa cards, or even the American Express card. Anyone else have a new-fangled credit card without embossed numbers? I just got a new Visa card last month and mine still has raised letters and numbers. I added a picture of the card to the original post, and Yeah, we had just received new cards from HSBC last month that was normal. I suspect this is the way it's gonna be going forward, but I wish that they had imprinted the info in such a way as to make it permanent, either under a top clear surface or hot stamped into the surface to protect the filling ink. And then when ATT turns on Google's ability to use the NFC chip in my phone so I can use Google Wallet I won't even have to carry a credit card, just my phone. We've had one from Chase for about a year that has no raised numbers, also has a chip that can be read without sliding it thru the cc machine. Guess they can be read by crooks too. My card from my bank doesn't have raised numbers either...it's at least a year old. No the numbers haven't worn off. My new bank card still has raised numbers (got it last month). However my homecare client has a charge card from last summer that is the smooth variety. It seems to work fine...he had the same concerns. My last two or three bank cards havent had raised numbers. I thought this was to try and stop fraud (try being the right word!) and the fact that technology has moved on, so no need to use the old fashioned carbon machines. I can also add a photo of anyone I wanted printed onto my Barclays bank card, I havent gone ahead with this, as it just feels strange. I just read about cards now not having raised numbers. The raised numbers were needed for the machines where you put the card in, put the carbon paper(!) stuff on top, and ran the presser thing over the card to imprint the numbers. Now the strip on the back of the card contains all the info, so the raised numbers aren't needed.